Cynthia Martin reports on what cartoonists reflected in visual narratives of stem cell science. Here’s an amusing experiment that won’t blow up your office or maim a spouse; ask people when stem cells were proven. It’s not complicated. If you get “for what?” as a rejoinder, the person might be stalling or indeed scientifically savvy. My guess on the best you’ll hear is “ummm 10 years?” or an informed but tangential “I read a cardiovascular study….” Not many will cite the 1961 paper by two Canadians on bone marrow cells, or answer “52 years,” the latter of which sounds much worse to someone in middle age, but I digress. 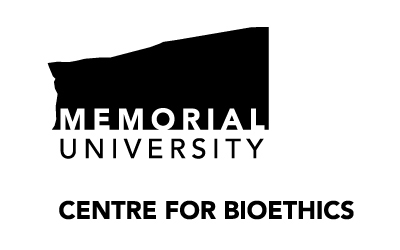 Two years later, in 1963, those researchers, Ernest McCulloch (deceased) and James Till (who I heard – ever modest – is a Toronto cancer care volunteer) showed self-renewal and differentiation in bone marrow cells, essentially starting the global rush to commoditize stem cells. By 1998, however, when human embryonic stem cells were first isolated, impressionable damage as to the importance of stem cell science had already been done. Think back to Dolly, the cloned sheep (born in 1996 and revealed to the public in 1997), and cartoons of grotesque science fiction scenarios showing women birthing sheep and sheep multiplying enough to sedate insomniacs. Could anyone hold such dissonant images in their minds alongside a fantastical hope of stem cells curing disease? Even given the powers of limitless imagination in a world where more people know what a Kardashian is than the point of birth control, I think not. In translating drama about public understanding and the uptake of stem cell science, the humanities limped along muttering narratives, lobbing science fiction missives and holding up colorful paintings and photographs of cells. Meanwhile, stem cell researchers suffered the slings and arrows flung by technology as those innovators rode off in their wireless golden chariots. 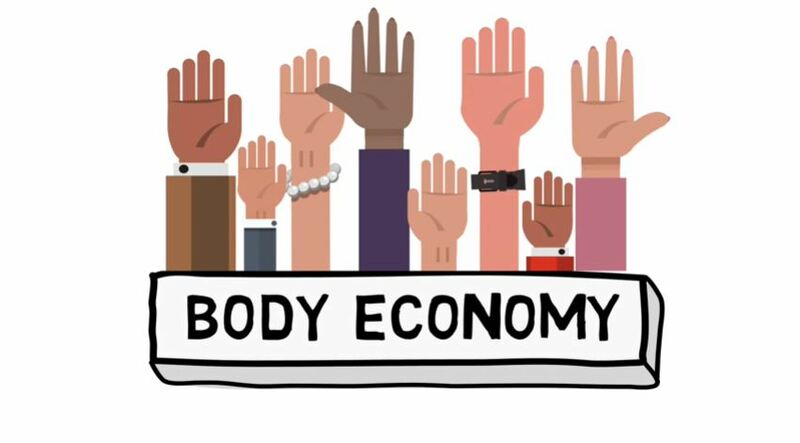 With the humanities often disparaged for its lack of data, surely something could be counted and interpreted in reflecting on the public’s understanding of stem cell science? Yes…cartoons. TOLES ©2002 The Washington Post. Reprinted with permission of UNIVERSAL UCLICK. All rights reserved. Cartoons tell stories in a judicious use of space in narratives of empathy and sympathy, irony and wit. A March 2009 cartoon shows newly-elected President Barack Obama blowing dust off a book entitled Science. To encourage scientific citizenship, Obama increased education funding in restoring science to the national agenda. But as befits a cartoonist’s task (and as Northrop Frye wrote), irony never says what it means; cartoonist Clay Bennett (2002 Pulitzer Prize winner) didn’t tell viewers what to think, but to think. Lest you think cartoons are marginal, 2000 IgNobel winner – awards acknowledging achievements making people laugh and think – Sir Andre Geim said, “If people don’t have a good sense of humor, they are usually not very good scientists either.” He later won the 2010 Nobel Prize in Physics. 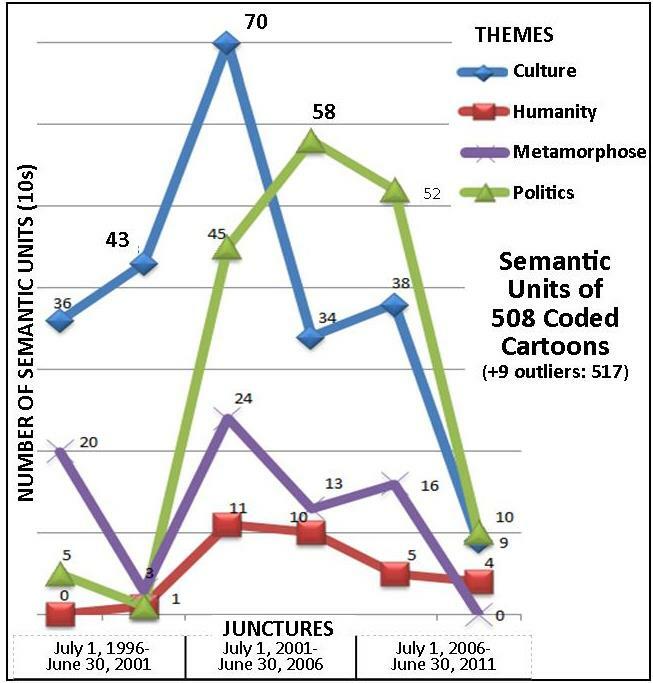 I sourced 517 semantic units (an academically sounding term I use for cartoons) over a 15-year period in three 5-year junctures: July 1, 1996 – June 30, 2001; July 1, 2001 – June 30, 2006; and July 1, 2006 – June 30, 2011. Each semantic unit (9 outliers) was coded in one of the following themes: Culture, Humanity, Metamorphose and Politics. Reflecting fears in William Shakespeare’s and Aldous Huxley’s brave new worlds, the Culture theme is most prominent in the first juncture (79 of 111 semantic units). The second juncture starts a transition. Of 269 semantic units, Culture at 104 semantic units edges out Politics at 103 semantic units, mirroring then-President George W. Bush’s war priorities. In the last juncture, as stem cells fall off coverage priorities, Politics is prominent (62 of 137 semantic units). All told, Culture leads the study with 230 semantic units over a 15-year period. Politics is next with 171 semantic units. My research results were curious insofar as I expected dominance of biomorphism and anthropomorphism, under the Metamorphose theme. Yet there were only 76 (of 517) semantic units in the 15-year study period. However, the larger irony was that Humanity–the entire point of stem cell use being to help alleviate and cure disease and injury–was conspicuous by its absence. Humanity was the lowermost represented theme over the 15-year period with only 31 of 517 semantic units. Additionally, when comparing the social construction themes of Culture and Politics with the nature themes of Metamorphose and Humanity, cluster weights were 401 to 107 semantic units. Why the low number of cartoons (semantic units) under Humanity? With only 41 of 517 cartoons by females, an afterthought hypothesis emerged – perhaps, gender matters. While the gendered history of cartooning is undeniable, it is doubtful gender explains content discrepancy. Cartoonists are keenly attuned to media, public discourse and humankind, ergo, humane. An alternative hypothesis is that cartoonists were as confused as everyone else as to the point of stem cells. Think back to Dolly cartoons in the years preceding the discovery of embryonic stem cells. The scientist identified as her “inventor” (Ian Wilmut) admitted – years later – that others did two-thirds the work. But as with job interviews and corrections in tiny type 10 pages in from the FRONT PAGE, stem cells didn’t have a second chance to make a first impression. 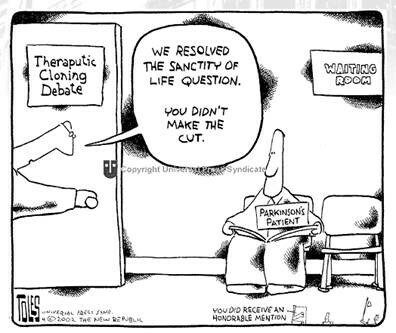 Having worked largely in healthcare communications, I think if stem cells’ therapeutic potential had been effectively communicated from the start – as organ transplantation was – there would have been understanding of, and more support for, this science, cartoonists being narrative translators who remind us to think. I enjoyed this thought provoking piece. I love stem cell cartoons and have gotten into drawing some myself the last few years. I’ll have to check out how my cartoons compare to the patterns described here. I’d encourage people to take a look at my efforts at stem cell cartoons both on my blog (http://www.ipscell.com) and in my new stem cell book, Stem Cells: An Insider’s Guide. “cartoonist Clay Bennett (2002 Pulitzer Prize winner) didn’t tell viewers what to think, but to think.” Love this, great article.